Exide industrial segment includes sales to power backup equipment (UPS), traction equipment (forklifts, golf carts, electric vehicles), infrastructure sector (railway, telecom, solar, power generation and utilities) and exports (traction and standby). No need for checking electrolyte level and topping throughout its life. Sealed construction ensures no leakage or seepage of electrolyte from terminal or casing. The sealed construction with immobilized electrolyte allows the battery to be installed in any position, horizontal, vertical, sideways - without any effect on its performance. The unique gas recombination technology effectively nullifies generation of gas during normal use. It is totally eco friendly, ensuring clean and safe environment. Since the battery emits no gases or fumes, it can be placed adjacent to the UPS System or other electronic equipment, ensuring minimal voltage dorp between battery and equipment. Lightweight and compact. Modular construction, easy to install and easy to connect and commission. Available in fully (factory) charged condition. Between 3 to 5 years life for small and medium monobloc range (EP Range) depending on cyclic / float applications. Self discharge very low as compared to conventional flooded battries. Excellent charge retention and recovery ability due to special design of plates and separators with an absolutely balanced electrolyte. Very low internal resistance and very high electrolyte - active material reactive interface - allows very high currents for short and medium duration. Tough construction and heavy duty design with superior corrosion resistant lead calcium tin alloy. Saving of handreds of litres of distilled / demineralised water throughout it slifetime as compared to conventional battries. Saving of manpower for regular topping up and cleaning corroded terminals as in conventional batteries. No need of separate battery room. Can be installed by stacking together in any convenient orientation or position, thereby saving huge floor space as compared to conventional batteries. Cuboidal space thus saved can be utilized for other equipment's / installations. This is specially relevant in costly metropolitan areas. Battery can be installed inside offices and working areas - no need for separate battery rooms, costly acid proof flooring etc. Battery can be installed in a installed in a cabinet also. No need for elaborate air exhaust systems as in conventional battey installations. Saving from transmission loss - Higher efficiency - Lower electricity consumption - Lower cost on cabling. No delay between receipt and use. Instant power source. Comparable with the best international makes. Better than the international makes in the same capacity range. 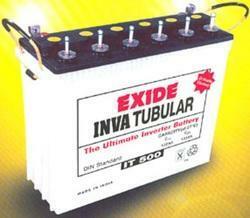 The range of Tubular Batteries is best suited for inverter applications in Indian conditions. Its superior features have made it an undisputed market leader. The ultimate tubular batteries especially designed with thick tubular plates to withstand long and frequent power interruptions. 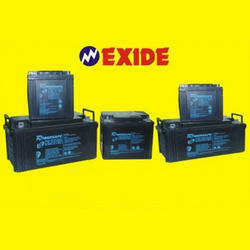 We are highly acclaimed in this industry for providing an optimum quality range of Exide Lead Acid Batteries. 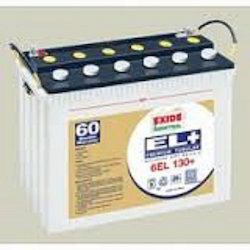 Looking for Exide UPS Batteries ?